NB: Following a strategic assessment of Tabakoto, the mine was deemed to be non-core and a sale process was therefore launched, in-line with Endeavour's portfolio management and capital allocation strategy. The asset was classified as held-for-sale, included as part of the Company's discontinued operations. George Town, August 1, 2018 - Endeavour Mining (TSX:EDV) (OTCQX:EDVMF) is pleased to announce its financial and operating results for the second quarter of 2018, with highlights provided in the table below. Adjusted Net Earnings Attr. to Shareholders1, $m 9 24 7 34 2 n.a. Adjusted Net Earnings1, $/share 0.09 0.23 0.07 0.31 0.02 n.a. Sébastien de Montessus, President & CEO, stated: "As we reflect on the first half of 2018, Endeavour is tracking well against all of its key performance metrics, most notably production and All-In Sustaining Costs, and we remain on-track to meet our full year guidance. Construction progress at the Ity CIL project remains on time and on budget and we continue to anticipate the first gold pour by mid-2019. This is an important project for Endeavour, which, along with Houndé, has the potential to deliver step-change improvements across key metrics. We also continued to deliver strong exploration success, notably with the announced discoveries at Houndé in the Kari area where we anticipate a maiden resource for the Kari Pump target by year-end. We have significantly progressed our stand-alone greenfield exploration targets where we expect to start generating maiden resources later this year. Lastly, our strategic assessment of Tabakoto demonstrated the potential to reduce its AISC, mainly through capital investment to renew the underground fleet. These investments, however, do not meet our capital allocation criteria and therefore we have launched a sale process, as we ultimately believe that the asset is better suited to the portfolio of another company with an alternative strategy, as we continue to focus on lower-cost and long-life assets. We believe that we are very well positioned to meet our 2019 strategic objective of achieving an annual production of more than 800koz at AISC of below $800/oz and with a visibility of more than 10 years, as set in early 2016. This confidence is due to the important strategic milestones both already achieved - which include: the start-up of Houndé, the sale of non-core Youga and Nzema mines, the purchase of the Karma mine and Kalana project, and the important exploration success achieved notably at Ity - and upcoming milestones which include the sale of Tabakoto, start-up of Ity CIL and delineating the significant recent discoveries made at Houndé." Group production from continuing operations totaled 147koz in Q2-2018 and 299koz for H1-2018, well on track to meet full year guidance of 555-590koz. Production from continuing operations significantly increased in Q2-2018 compared to Q2-2017 due to the addition of the Houndé mine and an increase at the Ity mine (due to higher grades) which more than offset the expected declines at Agbaou (due to temporary lower grades as mining focused on waste capitalization) and Karma (due to a temporary change in ore type). The Tabakoto strategic assessment completed in Q2 demonstrated the potential to reduce its AISC, mainly through capital investment to renew the underground fleet. These investments, however, do not meet Endeavour's capital allocation criteria and therefore a sale process has been launched and non-binding offers have been received. As at June 30, the Tabakoto mine has been classified as an asset held for sale. Group AISC from continuing operations amounted to $780/oz in Q2 and $732/oz for H1-2018, on track to meet full year guidance of $760-810/oz. AISC from continuing operations decreased significantly in Q2-2018 compared to Q2-2017 mainly due to the addition of Houndé and a decrease at Ity (due to better grades) which more than offset the anticipated increases at Agbaou (due to a harder ore mix and lower grade), and Karma (due to temporary lower grade and lower recovery). Group AISC inclusive of Tabakoto amounted to $878/oz in Q1-2018 and $825/oz for H1-2018, also on track to meet full year guidance of $840-890/oz. Nzema (divested in December 2017) - - 27 - 53 n.a. - n.a. Production decreased mainly due to an expected decrease in the average head grade fed to the plant. However, the operation continued to perform ahead of expectations as plant throughput increased from 20% to 30% above nameplate capacity. Tonnes of ore mined remained steady as mining activities continued to perform with a decrease in the strip ratio. Transitional and fresh ore from the Vindaloo Main deposit continued to be the ore source, supplemented by oxide ore from the Vindaloo North deposit where mining began in late Q1-2018, and from the Vindaloo Central deposit where mining began ahead of schedule in Q2-2018. Tonnes milled increased while the ore blend continued to be primarily transitional/fresh ore with oxide ore, representing 25% of the mill feed. The average grade milled decreased slightly due to the anticipated mine sequence. Recovery rates remained steady at 95%. AISC increased mainly due to the lower processed grades, as well as higher unit costs and increased sustaining capital spend. Mining unit costs increased from $1.58 to $2.00 per tonne due to the volume effect of lower tonnes mined, slightly higher fuel prices, as well as additional blasting requirements. Processing unit costs increased from $10.91 to $11.41 per tonne milled mainly due to the transition to fresh ore. Sustaining capital spend increased by $3.3 million from $0 due to waste capitalisation. Non-sustaining capital increased by $1.1 million to $2.7 million due to pre-stripping activities in the Vindaloo pit. Commercial production began in Q3-2017. Tonnes ore mined, kt 1,312 1,361 n.a. Strip ratio (incl. waste cap) 6.13 6.57 n.a. Tonnes milled, kt 982 898 n.a. Grade, g/t 2.20 2.59 n.a. Recovery rate, % 95% 95% n.a. PRODUCTION, KOZ 67 74 n.a. Cash cost/oz 484 340 n.a. Tonnes ore mined, kt 2,673 n.a. Strip ratio (incl. waste cap) 6.36 n.a. Tonnes milled, kt 1,880 n.a. Recovery rate, % 95% n.a. Houndé is well on track to meet full-year 2018 guidance of 250-260koz at an AISC of $580-630/oz. Production is expected to decline slightly and AISC to increase to the guided range due to the rainy season, lower expected grades, and an increase in the strip ratio. Relocation activities at the higher grade Bouere deposit are progressing well. To minimize Houndé's non-sustaining capital spend while building the Ity CIL project, pre-stripping is expected to occur in early 2019. Houndé is the strongest exploration focus for Endeavour in 2018 with more than 121,000 meters already drilled in H1-2018, mainly focused on the Kari anomaly. As announced in May, the Kari mineralized zone has been significantly extended to a large area now measuring 4km long and 3km wide with three discoveries made and approximately 20% of the gold-in-soil anomaly remaining to be drilled. A further 60,000-meter drilling campaign is underway to delineate the two latest discoveries, with in-fill drilling ongoing on the Kari Pump target where a maiden resource is expected by year-end. Production slightly increased due to the higher grades of material milled as low-grade stockpiles continued to supplement the mine feed to allow waste capitalisation activities to progress. Tonnes of ore mined decreased as greater emphasis was given to waste mining, thereby increasing the total strip ratio from 10.7 to 11.8 (operating strip ratio increased from 6.6 to 9.4) while total tonnes moved remained fairly flat at 7.8Mt. Mill throughput was unchanged, however remaining at a high level as the proportion of fresh ore processed decreased slightly to 28% from 31%. Average processed grades increased mainly due to higher grade stockpiles supplementing the mine feed, while mined grades remained fairly constant. Recovery rates slightly decreased to 92%. Mining unit costs decreased from $2.88 to $2.65 per tonne as higher elevations of the West pit were mined. Processing unit costs decreased from $7.80 to $7.54 per tonne mainly due to continued cost savings realised on reagents following the implementation of a group procurement strategy. Sustaining capital costs decreased by $0.6 million to $1.8 million due to a reduction in the capitalised waste. Non-sustaining capital decreased by $5.1 million to $2.9 million as lower pre-stripping at West pit 5. As guided, production decreased and AISC increased as low-grade stockpiles supplemented the mine feed to allow waste capitalisation activities to progress more quickly. Agbaou is on track to meet full-year 2018 guidance of 140-150koz at an AISC of $860-$900/oz. 2018 is expected to be a transitional year for Agbaou with a focus on waste capitalisation activities that are expected to provide future access to high grade areas. Production is expected to increase in the latter portion of the year as waste capitalization activities provide access to higher grade areas, while costs are expected to continue trending towards the guided range as the hard ore blend and strip ratio increase. In H1-2018 more than 26,000 meters were drilled with the majority occurring in Q2. A total of more than 20,000 meters, representing most of the drilling, was focused on open pit targets located along extensions of known deposits and on parallel trends. Mineralization was confirmed at the extensions of several deposits including the MPN, North Pit Satellite 3, West Pit 5 and Beta, with 5,000 meters of follow-up drilling planned in H2-2018. The at-depth potential of the North pit was tested and mineralization was confirmed. However, as a potential resource in this area may not be suitable for open pit operations, the focus was directed to the abovementioned open pit targets. Production decreased due to lower stacked tonnage despite an increase in grades and recovery rate. Tonnes mined increased as expected as mining activity ramped up in anticipation of the rainy season in Q3-2018 and to expose higher grade ore to be mined in future periods. Mining at the GG2 pit was completed during the quarter and mining increased at the Kao pit where mining began in late Q1-2018. Stacking decreased due to a change in ore characteristics and ore flow through the leach pad conveying and stacking circuit. Stacked grade increased due to transition to the higher-grade area of the Kao pit. As expected, recovery rates increased due to mining activities focusing mainly on oxide ore from the Kao deposit. AISC increased mainly due to higher processing unit costs associated with lower tonnes stacked. Mining unit costs decreased from $2.51 to $2.08 per tonne due to the volume effect of more waste mined which has resulted in lower drill and blast costs at the Kao deposit. Processing unit costs increased from $7.84 to $10.50 per tonne due to lower tonnes stacked. Sustaining capital costs decreased by $0.1 million to $0.5 million mainly due to a decrease in capital stripping costs. Non-sustaining capital spend increased by $2.3 million to $5.5 million mainly due to pre-stripping at the Kao deposit. Production decreased and AISC increased due to the lower recovery rate associated with treating the GG2 transitional ore in H1-2018, while H1-2017 benefited from higher recovery rates associated with oxide ore and high-grade ore from the Rambo deposit. Karma is on track to meet full-year 2018 guidance of 105-115koz at an AISC of $780-830/oz as the second half of the year is expected to benefit from oxide ore from the Kao deposit. This is expected to have higher grades, higher recovery rates and lower unit costs. In H1-2018, more than 23,000 meters were drilled, mainly focused on the Eastern extension of the North Kao deposit, on Yabonsgo and on Rambo West where indicated resources are expected to be delineated by year-end. In addition, auger drilling and soil geochemical sampling was conducted on earlier stage targets such as Rounga and Zanna. A further 5,000 meters of drilling are expected to be completed in H2-2018. Production increased significantly due to higher grades stacked as mining activities at Bakatouo has produced higher grades as well an increased recovery rate. Tonnes of ore mined decreased to match stacking capacity. Fewer tonnes were mined at the Ity and Zia North East pits as mining ramped-up at the Bakatouo pit following its start in Q1-2018. The stacked grade increased significantly also due to the focus on Bakatouo ore.
Recovery rates increased significantly due to the improved leach kinetics associated with changes in ore type as well as reagent optimisation. AISC decreased mainly due to an increase in ounces sold and lower sustaining capital costs, which were partially offset by increased unit mining and stacking costs. Mining unit costs increased from $4.98 to $7.72 per tonne mainly due to longer haul distances and costs associated with fleet rentals. Processing unit costs increased from $14.67 to $16.81 per tonne due to lower tonnes stacked and greater reagent consumption associated with the increase in recovery rates. Sustaining capital costs stayed flat at $0.8 million mainly due to the decrease in waste capitalisation. Production increased and AISC decreased mainly due to increased stacked tonnage and higher grades from the Bakatouo pit, which more than compensated for lower recovery rates. Ity is on track to meet full-year 2018 guidance of 60-65koz at an AISC of $790-$850/oz. As guided, 2018 is expected to be a transitional year for the heap leach operation with greater priority given to the CIL construction activities. Open pit mining activities for the heap leach operation are expected to continue until the end of Q3-2018. The aim is to create a stockpile sufficient to feed stacking requirements for the latter portion of the year. Short mining campaigns may then be opportunistically conducted based on equipment availability and progression of the Ity CIL mining activities. The Le Plaque target where additional resources are expected to be delineated in H1-2019. The Daapleu deposit where mineralization was confirmed at-depth. In addition, a deep hole was drilled below the heap leach pad which confirmed the occurrence of mineralization 200 meters southwest of the Bakatouo deposit. In H2-2018, the focus is expected to be the Le Plaque target, with over 10,000 meters of drilling planned. The strategic assessment completed in Q2 demonstrated the potential to reduce the mine's AISC mainly through capital investment to renew the underground fleet. These investments, however, do not meet Endeavour's capital allocation criteria and therefore a sale process has been launched and non-binding offers were received. Production decreased mainly due to lower average head grades and slightly lower throughput and recovery rates. Open pit ore mined decreased as the Kofi B pit approached its end of life while extraction of the oxide portion at the Tabakoto North pit was ongoing. Underground tonnes mined decreased as lower equipment availability slowed production. The average gold grade milled decreased as lower-grade stockpiles were used to supplement the plant feed. The recovery rate decreased due to the change in ore fed to the plant associated with milling the low-grade stockpile. AISC increased due to increased sustaining capital and higher mining unit costs which were partially offset by lower processing and underground mining costs. Open pit mining costs increased from $2.65 to $3.45 per tonne due to additional blasting requirements at Kofi B. Underground mining unit costs decreased from $71.38 to $68.32 due to lower costs associated with the cement rock fill at Tabakoto underground. Processing unit costs decreased from $18.41 to $17.76 per tonne as cyanide and lime consumption was reduced to interact with the characteristics of the ore blend processed. Sustaining capital costs increased by $1.3 million to $7.6 million mainly due to increased spending on underground development. There was no non-sustaining capital spending in the quarter. Production decreased and AISC increased mainly due to a decrease in processed grades following the completion of the high-grade Kofi C pit in 2017. In addition, lower grade stockpiles supplemented the plant feed in H1-2018 to compensate for lower underground tonnage mined following decreased equipment availability. Tabakoto is on track to meet its full-year 2018 guidance of 115-130koz. The AISC however is expected to be above the guided $1,200-$1,250/oz due to increased sustaining capital development work planned. H2-2018 is expected to benefit from increased underground equipment availability following the arrival of new equipment. During H1-2018 nearly 5,000 meters were drilled on open pit targets while more than 13,000 meters were drilled in the underground mines with the aim of replenishing depletion. For H2-2018, a further 12,000 meters are expected to be drilled on both open-pit targets and in the underground mines. 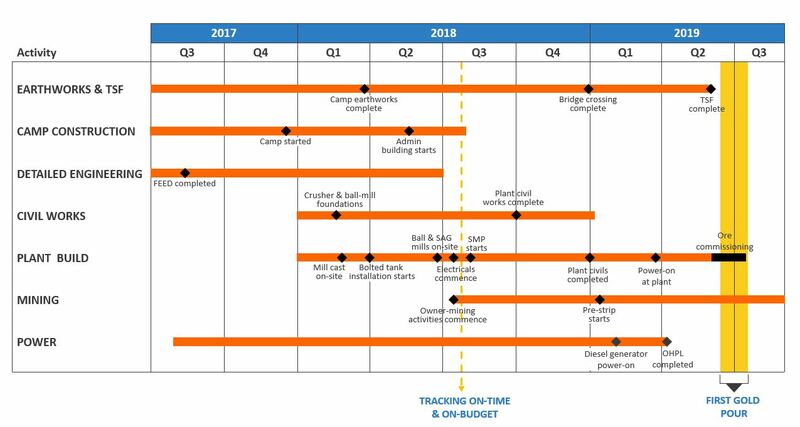 Construction is progressing well and remains on-time and on-budget with the first gold pour expected by mid-2019. More than 3.1 million man-hours worked with zero lost-time injuries. Overall project completion stands at over 50%, tracking well against schedule. Over 85% of the total capital cost of $412 million has already been committed. As at June 30, 2018, the remaining project spend amounted to $211 million, with the expected remaining cash outflow amounting to circa $191 million as an additional $30 million of equipment financing is expected to be drawn. The Ball and SAG mills have arrived on site, three months earlier than initially planned. Plant construction is progressing with all eight bolted CIL tanks installed with four already hydro tested. Tailings storage facility (TSF) earthworks are progressing well against schedule with over 60% already completed prior to the start of the rainy season. Camp construction progressed well with all 312 rooms completed and available for occupation. The 90kv transmission line and power station construction are progressing well against schedule with over 60% already completed. The land compensation process and resettlement activities are progressing well. More than 2,100 personnel, including contractors, are currently employed on-site, 95% of which are locals. An intensive exploration program, consisting of 48,000 meters of drilling, was finalized in early Q2-2018 on the Kalana and Kalanako deposits. Drilling confirmed the overall geological model and in-fill drilling is expected to convert a portion of the previously classified inferred resources in the North Eastern part of the deposit. The remaining results from the last leachwell gold assays are expected to be received in the coming weeks following bottlenecks encountered in the labs. Endeavour is rebuilding the geological model based on both the drilling done by the previous owners and that which was completed this quarter, while using a more conservative top-cut assumption and an ordinary kriging geostatistical approach. In total, more than 2,200 holes and more than 221,000 assays (including over 103,000 leachwell assays) will be used to build the geological model which will form the basis of the updated feasibility study. An updated resource is expected to be published in late Q3-2018. At the Kalanako deposit, drilling has confirmed the continuation of the mineralization and is expected to convert a portion of the previously classified inferred resources. In parallel with completion of the resource model, initial work has commenced for the updated feasibility study which is expected to be published in Q1-2019. Exploration continued to be a strong focus in Q2-2018 with a company-wide exploration spend of $15 million, for 98,000 meters drilled, with details by asset provided in the above mine sections. More than 292,700 meters were drilled across the group in H1-2018, focusing mainly on the Kari discovery made at Houndé last year, with results published on May 24, 2018; on Kalana where an updated resource is expected to be published in late Q3-2018; and on the Le Plaque deposit where a global update of resources is planned for H1-2019. Initial work has also progressed on greenfield targets such as Kofi North, Fetekro, Randgold JV and in Greater Ity area. H1-2018 gold sales from continuing operations totalled 305koz, up from 174koz in H1-2017, mainly due to the increased production from Houndé. The H1-2018 realized gold price was $1,275/oz (net of the impact of the Karma stream) compared to $1,176/oz in H1-2017. H1-2018 benefited from the revenue protection program, based on a collar with a floor at $1,300/oz and a ceiling of $1,500/oz, which generated a gain of $5.5m, representing an $18/oz in addition to the realized gold price. The Group's H1-2018 All-In Sustaining Margin (inclusive of discontinued operations) increased by 68% from $99 million to $166 million due the inclusion of Houndé, higher realized gold prices, and an increase in gold sold at Ity, which offset the decrease in revenue generated by Agbaou. Non-sustaining capital spending increased by $6 million in H1-2018 over H1-2017 mainly due to an increase at Agbaou for waste capitalization activities, while non-sustaining exploration efforts increased by $10 million, in line with the Group's strategic focus on exploration. The All-In Margin increased by 81% in H1-2018 compared to H1-2017, amounting to $116 million, as the increased production at a lower AISC cost and higher realized gold price more than outweighed the increase in non-sustaining expenditures. The working capital variation outflow increased from $23 million in H1-2017 to $55 million in H1-2018 mainly due to an increase in stockpiles at Houndé and Karma, prepayments for reagents at Houndé as well as an outflow due to trade and other receivables driven by gold sales received at Houndé. Interest and financing fees paid increased from $7 million in H1-2017 to $22 million in H1-2018 due to the increase in debt outstanding related to the construction of Houndé and Ity CIL. H1-2018 had a net cash variation of negative $161 million mainly due to $163 million spent on growth projects (comprised of $153 million on the Ity CIL project inclusive of its associated working capital, $5 million on a new group IT system, $5 million on Kalana construction). $280 million was repaid on the revolving credit facility ("RCF") in Q1-2018 following the reception of $330 million from the convertible notes issuance. In Q2-2018, $70 million was then redrawn on the RCF to fund the Ity CIL construction. Net cash flow from operating activities during Q2-2018 was $60 million, up $12 million over Q1-2018, despite slightly lower revenues, as Q2-2018 benefited from a lower negative working capital variation. Net cash used in investing activities during Q2-2018 was $127 million, which included $87 million of growth project capital, $16 million of sustaining and non-sustaining mine capital expenditures, and $1.4 million of sustaining and non-sustaining mine exploration. Net cash generated in financing activities during Q2-2018 was $56 million, which was mainly due to $70 million drawn down on the RCF which was partially offset by $7 million of financing fees and $6 million of finance lease repayments. Equipment lease financing decreased by $10 million from March 31, 2018 to $69 million as at June 30, 2018 due to a $6 million repayment of current period obligations and $4 million following the removal of Tabakoto leases. As anticipated, net debt increased from $335 million as at March 31, 2018 to $410 million as at June 30, 2018, mainly due to growth project spending. At quarter-end, Endeavour's available sources of financing and liquidity remained strong at $339 million which included its $79 million cash position and $260 million undrawn on the RCF. In addition to these liquidity sources, Endeavour also has strong cash flow generation, upcoming second half of Ity CIL equipment financing, and the remaining proceeds from the Nzema sale. Due to the start-up of Houndé, operating cash flow per share (before non-cash working capital) for H1-2018 increased by 34% over H1-2017 to $1.52. H1-2018 adjusted net earnings per share from continuing operations amounted to $0.31, up from $0.02 in H1-2017. H1-2018 total adjustments of $40 million were primarily related to losses from discontinued operations, deferred income tax recovery, gains on financial instruments, and stock-based expenses. Management will host a conference call and live webcast on Wednesday August 1st at 8:30am Toronto time (EST) to discuss the Company's financial results.